The workshop will inciude Fertilization and Soil Testing, Water pH and Pesticides, Alfalfa and Fescue/Orchardgrass Selection, Alfalfa Management, Insect and Weed Management, MRGDC Update, NRCS & FSA Programs, etc. This event registration only accepts credit card payments (PCards allowed)! If you would like to pay with check or at-the-door, please visit: http://rsvp.nmsu.edu/rsvp/forage2018. New Mexico State University is an equal opportunity employer. All programs are available to everyone regardless of age, color, disability, gender national origin, race religion, sexual orientation or veteran status. 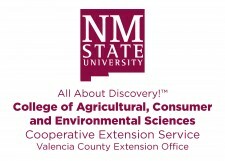 NMSU and USDA cooperating.